The Race to $1,000 per Share: Will Google or Amazon Cross the Finish Line First? Amazon pleases customers, but can it keep pleasing investors? Amazon (NASDAQ:AMZN) and Google (NASDAQ:GOOG) are two of the most iconic technology companies today. And they happen to be two of a growing number of high-priced stocks on the stock market, trading for more than $500 per share. Amazon shares closed Thursday at $534 while Google C shares closed Thursday at $626 and Google A shares closed Thursday at $655. We asked three of our www.fool.com contributors which stock would reach $1,000 per share first. Both companies have a strong case and one answer might surprise you. Brian Stoffel (Amazon): Both of these companies are core holdings in my personal portfolio. Combined, they comprise more than one-quarter of my family's real-life holdings. But if forced to choose which will reach $1,000 per share first, I argue that it will be Amazon. One of the hardest things for investors to calculate is what the behemoth's profitability will look like once it stops spending so much. Eventually, all the money poured into fulfillment centers and expansion of servers for the company's web services will hit a stable run rate. I don't expect CEO Jeff Bezos to slam on the brakes anytime soon, but he doesn't have to. He simply needs to tap on them a little, and the market reacts with wonder. In late July, Amazon reported a surprising profit of $0.19 per share; Wall Street was expecting a loss of $0.14 per share. The beat came from a combination of slightly higher revenue than expected, slightly lower expenses, and a breakdown of just how healthy the company's cloud services are. The stock responded by jumping 20% when the market opened. Though it settled down later in trading, it highlights an important point: When the news is positive, Wall Street starts baking in even more lofty expectations into Amazon's stock price. I expect that dynamic to help Amazon break the $1,000 barrier first. Travis Hoium (Google): Answering whether Google or Amazon hits $1,000 per share first will ultimately depend on the mood of the market. As Brian alluded to, Amazon's stock has long been driven by revenue growth rather than generating real income, so that could continue well into the future. 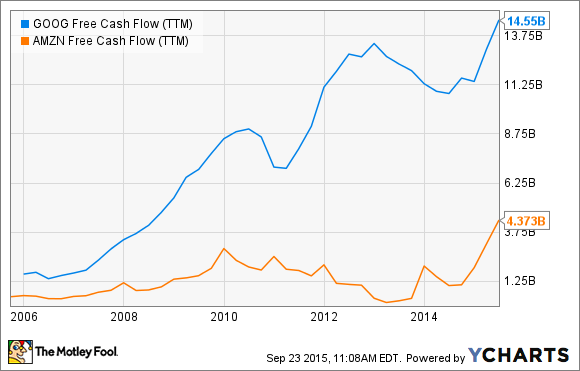 GOOG Free Cash Flow (TTM) data by YCharts. Amazon, on the other hand, would be much easier for consumers to abandon if another good option comes along. From a stock perspective, it has largely lived off the market's positive sentiment of the company to attain a high stock price, not strong earnings or cash flow. Someday the market will demand fundamental results and that's when I question whether the company can deliver. Online retail is fundamentally a low-margin business, streaming video companies have failed to turn a solid profit, and Amazon has failed miserably at getting further ingrained in our culture with smartphones and its own app store. Eventually, fundamentals will matter to the market and between Google and Amazon, the fundamental strength goes to Google. That's why it's my pick to hit $1,000 per share first. Dan Caplinger: Those who've looked at Google over the years will quickly remember that the company has already won a previous version of this contest, with the search-engine giant's shares having first vaulted over the $1,000 mark in late 2013. Only after its unusual split into Class A and Class C shares did the stock fall back into triple-digit territory, and the disparity in total market capitalization still reflects the perceived advantage that investors see for Google over Amazon. That aside, I'm a big believer in what I can see, and Amazon has consistently demonstrated that it's more interested in expanding its revenue reach than it is in delivering bottom-line profits to investors. Brian's points about a potential end to Amazon's aggressive spending are valid, but others have made predictions along those lines for years, and Bezos seems to have an endless capacity for visionary ideas that also happen to involve delaying consistent profit growth another few years down the road. Even with some of Google's challenges in adapting to a mobile-driven world, its reliable profitability and value-priced shares make it a more attractive stock in my book, and the $100-per-share head start that Google's shares have over that of Amazon currently makes it a no-brainer pick as more likely to regain the $1,000 level first.